If one considers that in 2011, the price of Bitcoin was only US$0.30, and today it is trading at around US$3 600, it’s easy to understand why it has attracted the attention of many serious investors. In the preceding nine or so years after the introduction of Bitcoin, a number of other cryptocurrencies have hit the market. Many people have made huge profits from the cryptocurrencies yet others have lost massively. So, what differentiates those who have made a killing from those who are left with nothing but sad stories to tell? It is the ability to identify the risks inherent in this otherwise lucrative trade. While some companies have the ability to make a business website and run a legitimate cryptocurrency business, there are others which are taking chances out there. While many companies in the cryptocurrency market have invested heavily in ensuring that their systems are not easy to hack, there are a number of other companies that have been hacked before. Cyber risk is usually quite high when an investor is dealing with a company that does not have much experience in cybersecurity. It is also possible that even companies that may know the risk might not have enough capital to hire specialists or put in place a robust security system to protect investors who conduct business using its resources. Sometimes, the risk does not even emanate from the company; it comes from investors who are lax with their own security while on the internet. Stockholders who have no means of tracking their cryptocurrency investments are at risk of having their investments sitting and earning money while they have no idea they are accumulating wealth. One of the biggest risks in the cryptocurrency industry has often been the lack of geographic location where markets are based. What this means is that there is often no clarity when it comes to a jurisdiction where any disputes can be entertained. There is also a grey area when it comes to the way cryptocurrencies will be taxed in the future. Even though a number of countries have entered the cryptocurrency scene with the aim of becoming safe havens and profiting from the trade, there is still a lack of coordination. For investors used to a banking system with clear regulations and dispute resolution mechanisms, cryptocurrencies still pose an uncomfortable risk. The value of a particular cryptocurrency depends on the confidence that the market places on it. This is the reason why at the end of 2017 the Bitcoin saw such a high level of turbulence. When countries like China ban the use of cryptocurrencies, many investors are likely to attempt to dump the currency into the market. This results in a massive loss of value. There are people who enter the market with the aim of speculating and in the process making huge profits. This causes a big risk because cryptocurrencies are not regulated by any central authority such as a central bank. Consequently, the value of any cryptocurrency at any given time is determined by the actors in the market based on the transactions they enter into. What this means is that overconfidence could make certain currencies overpriced while a lack of it can lead a given cryptocurrency to crush. The risks inherent in cryptocurrencies explain the reason why many businesses in a number of countries are still hesitant to accept cryptocurrency as a means of exchanging value. Businesses already operate in a risky environment and do not want to add another layer of risk. Businesses are not like individuals who can remain anonymous behind a computer. They have to comply with stringent tax and regulatory regimes. Apart from this, before businesses are able to accept payment in cryptocurrency, they will need to put systems in place. This requires manpower and more capital to manage the risks that come with this. The resilience shown by cryptocurrencies is an indication that they are here to stay. People and businesses will also take time to accept them as exchanges of value. It is likely that with time, some of the current risks will be mitigated. Putting the fun back into non-fungible tokens (NFTs), a new blockchain startup, which today launches its individual product, is creating the world’s first vinyl toys that are fully traceable on the Ethereum blockchain. Starting today, CryptoKaiju will be shipping 130 Genesis figures to customers, which is designed to illustrate a bitcoin-themed traditional Kaiju monster. It’s also an appropriate name for the first seeing as it’s the same word to name the first block in a blockchain. The team behind it are also launching their subscription box service, but shipping later in December. With this subscribers will receive a unique, crypto-themed figure each month. To ensure they aren’t mass producing toys, the subscription boxes will be limited to a set amount of pieces a month. The team behind Kaiju, taking reference from the Japanese film genre, are hoping that they can tap into a growing market of enthusiasts who want to be able to verify their collectibles. With the toy market lacking provenance and verifiable authenticity, the team are exploring opportunities to work with artists who are interested in seeing how the technology can be used in the scarcity and provenance of collectibles. As a longtime collector of designer toys such as Kaws, Futura Pointmen and Medicom Bearbricks, I’ve previously had issues with not having full confidence that what I was buying was genuine, as well as issues with knowing exactly how many items have been produced in each batch, said Oliver Carding, co-founder of CryptoKaiju. The concept of bringing not just provenance, but also a personality, through a set of attributes to a physical toy is extremely intriguing. Carding, who is also the founder of Manchester-based blockchain news site CoinJournal, established in 2014, has teamed up with David Moore, James Morgan and Andy Gray, the three co-founders of KnownOrigin, a Manchester-based digital art marketplace. Connecting with the KnownOrigin team at a blockchain meetup, Carding wanted to explore linking NFTs to physical collectibles. Represented as a token that sits within a smart contract, each toy contains unique metadata describing it. This includes its birth date, gender, color, a description and two personality traits such as “intelligence” or “creativity.” According to the team, certain traits and colors will be scarcer than others, resulting in varying demand for the toys, in addition to the excitement of the unknown. Carding, who first became interested in cryptocurrencies and blockchains around five years ago, said that vinyl toy collectors are embracing when the team are doing. The idea of having a toy where you can prove scarcity, one with unique digital traits is really appealing to them, he added. Ethereum and NFT fans love the idea of having a physical NFT as well as a cool collectible for their desk. Interest has also been seen from game developers using Ethereum who want to integrate the NFT into their products, in addition to distributors and independent toy and art store owners who want to buy the toys. Talks are also being had with investors in the space. This is the first step for CryptoKaiju, but their aim is to develop a decentralised platform that “allows for the creation and trading of physical items backed by tokens and improves how provenance is handled for physical art and collectibles,” said Carding. Individual toys are priced at $55 while subscription boxes are available on a six-month subscription at $320 and a 12-month subscription at $600. Perks for subscribers include quicker shipping, beta access to new features, priority access to special offers, collaborations, new projects and free merchandise. Tech giant Amazon is launching a blockchain service to help clients develop blockchain networks without incurring the costs of creating their own platform. Announced Wednesday at Amazon’s re:Invent conference, the Amazon Managed Blockchain platform “is a fully managed service that makes it easy to create and manage scalable blockchain networks.” Users can build platforms using either Hyperledger Fabric or ethereum, though the latter is not yet available. The new platform is another aspect of Amazon Web Services, Amazon’s cloud computing subsidiary which powers a large number of websites and services, including platforms like Netflix. “Amazon Managed Blockchain eliminates the overhead required to create the network, and automatically scales to meet the demands of thousands of applications running millions of transactions,” the service’s website says. The service is currently in preview, meaning those interested can sign up. If approved, they will be able to create a blockchain network, at which point they can either invite other Amazon Web Services members or “create more members in your account to simulate a multi-member network,” according to an FAQ section. Depending on the country, cryptocurrency startups may have to register their business with regulators depending on the token issued. So, let’s take a look at what each of the classifications mean, quickly. The most famous example is the MakerDAO – an autonomous, smart-contract powered blockchain organization that reinvested profits from its ICO to generate more profit for holders. This was deemed to be the critical factor that allowed the SEC to retroactively classify the digital assets issued by MakerDAO as investment tokens (and by extension, securities). “We’re trying to break the data monopoly situation currently,” Xin Song told CNBC’s Arjun Kharpal at the East Tech West conference held in the Nansha district of Guangzhou, China. Xin’s company makes an artificial intelligence (AI)-focused blockchain platform, which provides digital marketplaces of data and models to help train AI programs and connect them with users, as well as networks for computing power and data storage. The firm’s boss explained that AI models can issue crypto tokens using the Bottos platform in exchange for data from entities using its data marketplace. “Currently, almost all the big data are controlled by the industry giants, and for the small-to-medium companies it’s very difficult for them to get the data,” he said. “I think with more and more people adopting bitcoin and other crypto tokens, then more and more usage will be adopted by people,” he said. Some governments — China’s included — have taken a markedly harsher stance on cryptocurrencies. Beijing last year banned a controversial practice known as an initial coin offering, or ICO, where start-ups raise money by selling new digital tokens. The government also shuttered local bitcoin exchanges. Speaking about his own company’s business model, where firms are rewarded in cryptocurrency in exchange for data, Xin suggested Bottos could only grow more from here. “I think more and more people would accept this way to be rewarded,” he said. “Blockchain has got it made,” says Riggs Eckelberry, Chairman of the WaterChain startup, in a Forbes op-ed. He goes on to say that IBM will provide enterprise blockchain tools for easy dApp implementation such as with supply chains. His positive approach makes sense. As CEO of OriginClear – a company working in the water treatment industry, Eckelberry wouldn’t have expanded to blockchain-based WaterChain without good reason. The Chairman’s new project looks to crowdsource funding for water cleanup projects. Right now, there aren’t assets that are established and regulated. It’s just too early for that to happen. Companies complaining about crypto aren’t helping either. They don’t realize that regulated assets are all relatively new. The WaterChain boss illustrates this comparison by saying that “the world’s most successful alternative currency is the frequent flyer mile.” Essentially, digital assets represent value, and that value can be worth much more than airplane miles. Frequent flyer miles represent a rewards program. Customers feel valued and enjoy extra benefits for using a service. However, Eckelberry claims that these rewards should be transferable. But who owns them? The company or the customer? Regardless, the blockchain can make that possible. In fact, the CEO believes that crypto will create an entirely new economy around this concept. One that has little to do with our current fiat industry. Eckelberry then claims that the crypto market is on its way towards adoption, just as the blockchain market is. In fact, the blockchain industry has an expected value of $20 billion by 2024. Yet, cryptocurrencies have a current market cap worth $214 billion, and Bitcoin is half of it. 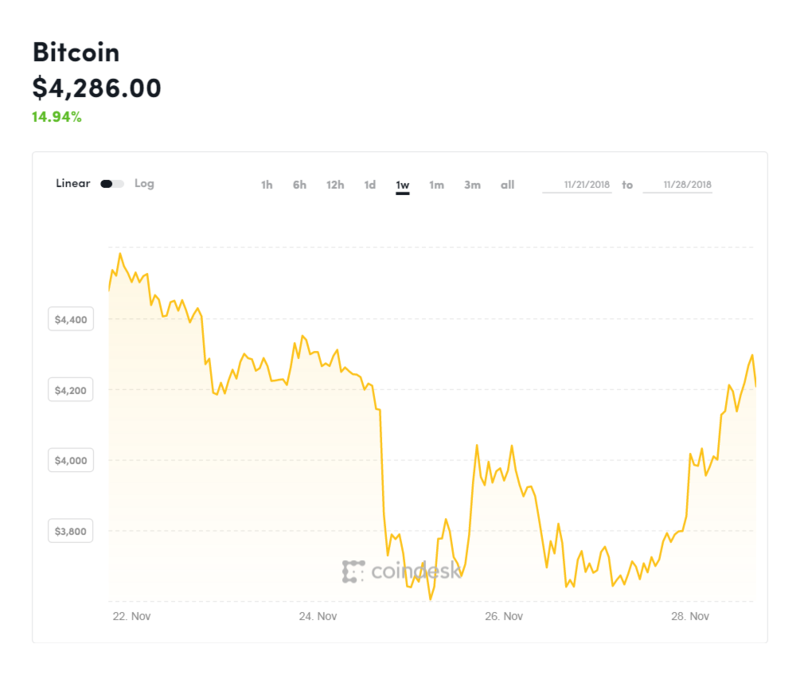 Bitcoin saw a double-digit rebound Wednesday after weeks of struggling to recover above the $4,000 mark. The world’s largest cryptocurrency spiked as much as 16 percent, hitting a high of $4,341.44, according to data from CoinDesk. The upward move was an abrupt turnaround from bitcoin’s terrible Thanksgiving week. The cryptocurrency tanked 35 percent over seven days, falling below $3,500 for the first time in 14 months. At one point, it was down 80 percent from its all-time high and within range of its worst-ever bear markets. Other major cryptocurrencies also rallied Wednesday afternoon. XRP, the second largest by market cap, rose 12 percent. Ether, the third biggest, was up 14 percent, according to CoinMarketCap.com. The entire cryptocurrency market capitalization rallied by more than $20 billion in 24 hours, according to data from CoinMarketCap. Bitcoin is still deeply in the red this year. The cryptocurrency has dropped by more than 68 percent in 2018, and is now off more than 77 percent from its all-time high. “Today’s rise is mostly a reaction to the precipitous drops last week and people thinking that may have been an overreaction,” Bromberg told CNBC. Because crypto markets are still relatively small, one buyer placing an especially large “buy” order can “kick off an avalanche,” Bromberg said. Brian Kelly, CEO of BKCM, said bitcoin may have also been boosted by “hash wars” over bitcoin cash finally coming to an end. That digital currency split into two competing versions earlier in November— “Bitcoin ABC” and “Bitcoin SV”. While Kelly said positive headlines this week didn’t necessarily result in the double-digit percent spike, it was good for the overall sentiment in crypto markets. “People are starting to understand that this is a legitimate asset class,” Kelly said. Bitcoin got the backing of a key figurehead on Wall Street this week. Jeff Sprecher, chairman of the New York Stock Exchange and CEO of ICE, said at the Consensus Invest conference Tuesday that despite headlines of cryptocurrencies flopping, digital assets have a future in regulated markets. Sprecher’s Intercontinental Exchange, parent company of the New York Stock Exchange, is backing a version of bitcoin futures through a start-up called Bakkt that go live in January. Nasdaq and VanEck are also planning to launch cryptocurrency products, which include bitcoin futures, in the first quarter of next year. SEC Chairman Jay Clayton said at the same Consensus conference that there are certain problems in the market that need to be solved before he would feel “comfortable” greenlighting an exchange traded fund, or ETF. But he didn’t rule out the possibility of that investment vehicle being approved once the issues are resolved. Blockchain is on everyone’s lips these days but, as we learned during the recent Blockchain Technology Conference, before choosing blockchain, you have to ask yourself one question: Do I really need it? We caught up with Dan Middleton, chair of the Hyperledger Technical Steering Committee to discuss blockchain’s technical challenges, the dos and don’ts and what fascinates him about this technology. JAXenter: What are the technical challenges that lie ahead for blockchain? What are the opportunities? Dan Middleton: Hyperledger is focused on enterprise blockchain use. In that space, blockchains are all about facilitating agreement among parties that may be in competition with each other. To provide that adversarial trust, nodes in the network must evaluate transactions and communicate to reach protocol agreement. That process will necessarily be slower than a centralized database architecture. This is one of the costs to receive the core benefit of a blockchain network. Performance will be a fundamental challenge of any reasonably distributed architecture. Privacy and confidentiality fall in the same boat. A blockchain is essentially a shared database. I have colleagues at Hyperledger who hate when I say that. It simplifies too much of the transactional functionality of these systems. However, the end goal is that parties who don’t trust each other can basically read and edit the same database. As this is a shared data layer, it’s fundamentally not secret among participants. Hyperledger projects are actively researching and experimenting with how to satisfy the conflicting goals of shared state agreement among parties and information confidentiality between parties. Before companies can interact on a network and form business agreements, they need to be speaking the same data language. Today, most systems are forced to trade one of those requirements off against the other. For example, you can maintain confidentiality of some data by simply not putting that information on the chain, but of course at the expense of actually having network agreement and preservation of that state of information. Perhaps less exciting to talk about is getting to common data definitions. Before companies can interact on a network and form business agreements, they need to be speaking the same data language. Historically, standards bodies have filled that role, but the rapid pace of blockchain development may lead to less traditional standards bodies. Each of these challenges is, of course, also an opportunity. Privacy and confidentiality stand out as the biggest of the three technical opportunities here. Given the breadth of blockchain architectures and usages, there’s also going to be a variety of privacy and confidentiality solutions. JAXenter: Hyperledger currently has 10 projects under its roof but even if it has become a trusted name in the blockchain ecosystem, there are still some misconceptions. What is the misconception that annoys you the most? Dan Middleton: Well we set ourselves up for one misconception early on. The name Hyperledger is fantastic, and it fits with an early premise that we would make a single blockchain stack. However, that premise very quickly evolved to the point where we are now with a variety of projects. When people first encounter the name “Hyperledger,” many still understandably assume it is a single project, which is a single ledger. I invite everyone to come take a look in our greenhouse and see all the interesting ideas we have growing here. Hyperledger is far stronger for having a diversity of ideas. JAXenter: Companies and institutions throughout the world have achieved great results with blockchain. For example, Germany’s central bank and Deutsche Börse have successfully completed a blockchain trial for securities settlement. Given all the recent success with this technology, I have to ask: Is blockchain a technology we cannot live without? Dan Middleton: I actually enjoy NOT selling people on blockchain. I think this technology solves a narrower problem than some of the broad statements in the industry suggest. For blockchain to be really successful, we have to understand where and why to deploy it. In my view, it is primarily valuable when you have multiple parties that need to alter and agree on the state of information without an intermediary. Being more specific about the problem space does not reduce the value. Rather, it’s simply important that we center our enthusiasm. JAXenter: What fascinates you about blockchain? Dan Middleton: I love distributed systems problems. One aspect of them is emergent behavior. Can you give autonomous systems each a small and uniform set of rules or behaviors and have the interaction of those systems result in a higher level behavior? That fascinates me. This is exactly the problem for consensus algorithms, particularly random leader algorithms like PoW and Mic Bowman’s PoET. Blockchains also provide practical requirements for privacy-preserving cryptography. Zero knowledge techniques (proving things without giving away any information) have been around for years, but there weren’t a ton of practical places to make use of them. The explosion of techniques that have erupted since Bitcoin came on the scene is very exciting. Assuming anyone who is reading this is already interested [in blockchain], I think getting your hands dirty is a great way to build experience and grow your talent. JAXenter: How can developers interested in this technology start a career in blockchain? What are the dos and don’ts? Dan Middleton: I think a “do” for any career decisions is to pick something that interests you. The converse is also true – “don’t” pick this as a field if it doesn’t interest you. As far as I can tell, the demand for talent well outstrips supply in blockchain, but just because there’s hiring in this space doesn’t necessarily make it the right decision for you. Assuming anyone who is reading this is already interested, I think getting your hands dirty is a great way to build experience and grow your talent. Working on an open source project is a fantastic way to start that exploration. It doesn’t have to be a Hyperledger project, of course, but pick a project. Try using it. What didn’t work for you? What could be improved? If you are a tech writer, help create better explanations for that project. If you are a developer, fix a bug and submit a patch. You’ll quickly learn more than you intended to. JAXenter: What is the TSC’s plan for the rest of the year? What would you like to achieve next year as the chair of the TSC? Dan Middleton: The TSC is responsible for the technical governance of Hyperledger projects. We help shape what kind of projects Hyperledger grows. We task technical working groups to solve certain problems or add definition where it is lacking. Participant Diversity: Our recent TSC candidate pool suggests that the Hyperledger community has not grown to represent the diversity of the broader technical community. As TSC chair, I would like to better understand where we are lacking and create programs to improve representation across the projects, working groups, and leadership. Interoperability and Reuse: A different sort of diversity is in the technologies that comprise Hyperledger. We have a number of great projects, but currently the whole is not greater than the sum of the parts. I would like to help grow the areas of useful differentiation (particularly where it is not already well supported) while driving toward more reusable components and less redundancy. Technical Steering: While we have successfully incubated a number of projects, often the TSC is reactive to the growth of the community. I would like to bring the maintainers of different projects together to identify areas of confluence and actively seek out new projects in areas of weakness to improve the strength of the Hyperledger ecosystem. The crypto-lib lab serves as an interesting example of this kind of directed effort. Since that time we have created a committee to look at our community health to ensure that we are welcoming and retaining contributors. Hyperledger has grown more quickly than any Linux Foundation project. While it is large, it is still young. Taking an active role in managing that growth is part and parcel with our objective of being the place for serious blockchain development. We want everyone to feel welcome, and thankfully we haven’t had to deal with toxic behaviors, which we certainly won’t tolerate. In terms of better reuse and componentization, we’ve launched several labs intended to mature into projects offering functionality to the existing platform projects and useful in their own rights. Working directly in open source development is very rewarding. We’ve also taken subtle steps towards more proactive steering. In addition to coding projects, we also operate Technical Working Groups and Special Interest Groups. We asked our Governing Board to take oversight of the SIGs so that we can focus more squarely on the technology aspects of the development projects and Technical Working Groups. As the SIGs develop materials, they will share them with the TSC and circulate them to projects and working groups. It’s also worth pointing out here that we pride ourselves on transparency at Hyperledger. Anyone can participate in our Technical Working Groups, SIGS, and software projects. JAXenter: Can you sum up your experience with Hyperledger? Dan Middleton: That’s easy. “Best part of my career.” I’ve gotten to do a lot of cool tech over the years. Most of that has been secret, and I haven’t been able to talk to friends or collaborate widely on what I’m working on. Working directly in open source development is very rewarding. I can talk with anyone about new ideas and learn from people who have different backgrounds than me. I really can’t say enough about what a great experience this is. South Korea’s Ministry of Science and ICT will develop a blockchain voting system that will go on trial in the private sector in December. South Korea plans to develop a blockchain voting system, with trials starting next month in the private sector. The Ministry of Science and ICT, and the National Election Commission (NEC) said they will develop a blockchain-based online voting system by December. The NEC ran an online voting system, dubbed K-voting, back in 2013, which has since been used by 5.64 million people but trust in the voting system remains low due to hacking and fraud concerns. The latest system to be developed will apply blockchain in voter authentication and result saving, which will increase transparency and security, the government said. Voting will be conducted via mobile and personal computers. Data will be saved on a distributed network and all voters will be able to view voting results as they progress. The system will be used in surveys conducted by Seoul National University’s Blockchain Society and Korea Internet & Security Agency, the country’s internet content watchdog, starting next month. The NEC will then decide whether the system can be used for online voting after the trials. It will later add artificial intelligence, big data, and IoT technology to further upgrade voting systems, the NEC said. Last month, Seoul, the country’s capital, announced that it will create a 100 billion won blockchain fund that will go into promising start-ups in the sector. In February, the country announced that it would not ban cryptocurrency trading and will increase transparency of transactions. This is despite government’s initial concerns about the risks of cryptocurrency and blockchain. The South Korean government has since raided and arrested executives of some cryptocurrency exchanges suspected for fraud.